(Minghui.org) A reliable source in China reported the following story to the Minghui website. A Falun Gong practitioner’s husband’s friend received a kidney transplant in 2004. He lives in a town near Beijing. When news of the Chinese Communist Party’s (CCP) practice of harvesting organs from living Falun Gong practitioners became public, the practitioner asked her husband’s friend, “Do you know where your kidney came from?” He said, “Yes, I know. It was from a Falun Gong practitioner, a twenty three year-old young man.” The practitioner was shocked at this revelation, and asked him to provide more details. The patient, in his forties in 2004, went to a hospital for dialysis due to kidney failure. He saw his friend Liu there, who had gone through a kidney transplant. Liu told him to go to Beijing University Third Hospital for a kidney transplant. Liu had also introduced other people to the same hospital. The patient went to Beijing University Third Hospital and saw a large screen displaying the number of successful organ transplant surgeries in this hospital, including the number of liver, kidney and heart transplants. These numbers were covered up after news of the CCP’s organ harvesting atrocities became public. Dozens of people in the hospital were waiting for different organs at that time. One week after he was admitted to the hospital, he and another kidney patient were sent to a hospital in Rizhou, Shandong Province for transplant surgery. Hospital officials informed them that the organs they were to receive were from death row prisoners. However, they found out later that the kidneys were taken from living Falun Gong practitioners. The patient recounted that a dozen people had different organ transplant surgeries at the same time he was in the hospital. The hospital hurried to release him a few days after the surgery, even though he hadn’t completely recovered. Another group of people were admitted for organ transplants. The hospital performed organ transplant surgeries group after group. A family member of a nurse in Beijing Youan Hospital said that the nurse, together with a doctor and another nurse in her hospital, were busy traveling around the nation from 2003 to 2006 in order to acquire organs from “death row prisoners”. The so-called “death row prisoners” were between 30 to 40 years old. Their names or medical records were unknown. The nurses were ordered to label them “death row prisoners”, but was kept a state secret. The nurses weren’t allowed to share any information. The nurse and her two colleagues made a great deal of money during those years. The number of live organs harvested dropped significantly after 2006. China engages systematically in forced labour in all forms of detention facilities – prisons which house sentenced criminals, administrative detention for those not yet charged, and re-education through labour camps. A 1998 declaration of the International Labour Organization (ILO) commits all member states, including China, to eliminate forced labour. The Government of China reported to the ILO that its constitution prohibits forced labour and that there is a national policy of eliminating all forms of forced labour. China is not a country with an independent judiciary and the rule of law. There is no means in China of enforcing the promises in the Constitution. What the Constitution of China says is not a reliable indicator of what is happening in China. “Citizens of the People’s Republic of China enjoy freedom of speech, of the press, of assembly, of association, of procession and of demonstration”. “Citizens of the People’s Republic of China enjoy freedom of religious belief. “No state organ, public organization or individual may compel citizens to believe in, or not believe in, any religion; nor may they discriminate against citizens who believe in, or do not believe in, any religion”. Yet, these freedoms do not exist in China. So, when the Government of China says that there is a constitutional provision, its statements may be and often are smokescreens, exercises in hypocrisy. That is true of its statements to the ILO on forced labour. The same can be said about policy. China has many policies which diverge from reality. Indeed, the Government of China refers so often to the state constitution and Government policies when the reality is the opposite that the very Government reference to these standards should be an indicator that something improper is happening in China. A policy area with which I am familiar is organ harvesting, the killing of prisoners for their organs to be used for transplants. David Kilgour and I have written a report that some of those prisoners are Falun Gong practitioners detained for their innocent beliefs. The Government of China denies the conclusion of our report and says that those who are in prison merely because they are Falun Gong practitioners are not killed for their organs. Yet the Government does not deny that some prisoners are killed for their organs and that these prisoners are the primary source of organs for transplants in China. The dispute David Kilgour and I have with the Government of China is which sort of prisoners are killed for their organs. The Government of China says that the prisoners killed for their organs are all prisoners sentenced to death. Why we disagree with the Government of China, why we conclude that prisoners sentenced to death are not the only prison source of organs for transplants in China, I put to one side for now. I invite you to read our report Bloody Harvest to see how we came to our conclusions. The point I want to make here is that the Government of China, at the same time as it admits sourcing organs from prisoners, has a policy of not sourcing organs from prisoners. In a news release dated October 5, 2007, the World Medical Association announced at the annual General Assembly in Copenhagen that the Chinese Medical Association agreed that organs of prisoners and other individuals in custody must not be used for transplantation except for members of their immediate family. Liu Zhi of the Chinese Medical Association’s international department said that the agreement with the World Medical Association has no legal effect. He nonetheless expressed the hope that the agreement would influence China’s 500,000 doctors and government decisions, a hollow wish as long as China does not have an organ donor system or a law sourcing organs from the brain dead/cardiac alive. Chinese government hypocrisy on forced labour could not be more blatant. Forced labour in detention is not an abuse of Chinese law. It is the law. The Chinese Law on Prisons stipulates that prisons may punish a prisoner who is able bodied but refuses to work. The United States signed a memorandum of understanding with China in 1992 committing the Government of China to ensure that prison labour products are not exported to the United States. The US in 1994 signed a statement of cooperation which in principle allowed US officials to gain access to Chinese production facilities suspected of exporting prison labour products. The US China Economic and Security Review Commission in its report to Congress for 2008 wrote that “the Chinese government has not complied with its commitments” under the 1992 and 1994 agreement “making it impossible for U.S. officials to conduct complete and useful investigations of such allegations”. Speaking to U.S. journalists in November 1993, in answer to a question about the desire by rights groups to inspect prisons, then Chinese Foreign Minister Qian Qichen said, “I believe that if the Red Cross does put forward such a request…, we would give positive consideration to that request.” The Red Cross did put forward such a request, and there was no positive consideration. Persons are routinely detained in China without charge or for long periods before a charge is laid. Forced labour occurs in administrative detention and the euphemestically labelled re-education camps as well in prisons where sentenced criminals are kept. Once the practice of Falun Gong was banned in 1999, hundreds of thousands of Falun Gong practitioners travelled to Beijing to protest or to unfold banners calling for the group’s legalization.People came almost daily.Author Jennifer Zeng, formerly of Beijing and now living in Australia, writes that by the end of April 2001 there had been approximately 830,000 arrests in Beijing of Falun Gong adherents who had been identified. Those who revealed their identities to their captors were shipped back to their home localities. Their families were implicated in their Falun Gong activities and pressured to join in the effort to get the practitioners to renounce Falun Gong. Their workplace leaders, their co-workers, their local government leaders were held responsible and penalized for the fact that these individuals had gone to Beijing to appeal or protest. To protect their families and avoid the hostility of the people in their locality, many detained Falun Gong declined to identify themselves. The result was a large Falun Gong prison population whose identities the authorities did not know. As well, no one who knew them knew where they were. There are no statistics available of practitioners who were arrested but refused to self identify. From our interviews with released Falun Gong practitioners, we know that the number of those who did not self identify is large. But we do not know how large. Arrested Falun Gong practitioners were initially sent to administrative detention centres. Those who recanted were released. Those who did not recant were tortured. Those who recanted after torture were released. Those who did not recant after torture disappeared into the re-education through labour camps. The U.S. State Department’s 2005 country report on China indicates that its police run hundreds of detention centres, with the ‘re-education through labour’ ones alone having a holding capacity of about 300,000 persons. An extremely large group of people subject to the exercise of the whims and power of the state, without recourse to any form of protection of their rights, provides a potential source for organ harvesting of the unwilling. These detention facilities are not just forced labour camps. They are also potential forced organ donor banks. The investigations which led to the report David Kilgour and I wrote had many chilling moments. One of the most disturbing was the discovery of a massive prison/detention/labour camp population of the unidentified. Practitioner after practitioner who eventually was released from detention told us about this population. A collection of some of their statements is set out in our report. What these practitioners told us was that they personally met the unidentified in detention in significant numbers. We have met many Falun Gong practitioners who were released from Chinese detention. Yet, except for those detained during the early days of Falun Gong repression, we have yet to meet or hear of, despite their large numbers, a practitioner released from detention who refused to self identify in detention from the beginning to the end of the detention period. What happened to these many practitioners? Where are they? I went to Geneva in November 2008 to meet with the United Nations Committee against Torture about the report of Government of China on compliance the Convention against Torture. The Committee, in its November 2008 concluding observations, wrote: “While noting the State party’s information about the 2006 Temporary Regulation on Human Organ Transplants and the 2007 Human Organ Transplant Ordinance, the Committee takes cognizance of the allegations presented to the Special Rapporteur on Torture who has noted that an increase in organ transplant operations coincides with ‘the beginning of the persecution of [Falun Gong practitioners]’ and who asked for ‘a full explanation of the source of organ transplants’ which could clarify the discrepancy and disprove the allegation of organ harvesting (A/HRC/7/3/Add.1). The Committee is further concerned with information received that Falun Gong practitioners have been extensively subjected to torture and ill-treatment in prisons and that some of them have been used for organ transplants (arts. 12 and 16). We are independent from the Government of China and the Falun Gong community. The Committee against Torture did not mean to suggest anything different. What they were proposing was an investigation independent from the Government of China with which the Government of China would nonetheless cooperate by giving access to Chinese territory, documents, places of detention, and witnesses in China without fear of intimidation or reprisals. The Chinese Government reaction, by referring to “some biased committee members” suggests that some members of the Committee were biased and others were not. Yet, the Committee recommendations were unanimous. Either all the Committee members were biased or none were. The Government of China as well makes wild general accusations. It accuses the Committee of fabricating information without indicating what that information is which was supposedly fabricated. Nor does it indicate what are the comments in the Committee’s concluding observations the Government considers unreal and stigmatized. Despite the vagueness of the reaction, it is apparent that the Government of China did not accept the concluding observations of the Committee in their entirety. When it came to the Universal Periodic Review, a procedure of the UN Human Rights Council in which the human rights record of every UN member state is reviewed periodically, the Government of China was a lot more specific. I went to Geneva again, in January, this year and lobbied governments to raise the violations identified in our organ harvesting report when China’s turn came up at UN Universal Periodic Review Working Group. At the very least, I asked states to request China’s compliance with foundational rights, the respect for which would have made the violations we identified impossible. Many delegates did speak out for these foundational rights during the two hours of the Universal Periodic Review Working Group allocated to these speeches, but to no avail. The Government of China rejected virtually all these rights. The Universal Periodic Review Working Group came out with a report tabulating the recommendations of states which spoke during debate. The Government of China reaction, which followed immediately upon release of the report, gave us a clear idea of what its earlier words had meant. It accepted some recommendations, mostly from other gross violator states which commended the Government of China for its efforts and encouraged it to keep on doing what it was doing. It added that it would consider other recommendations. There was also a long list of recommendations the Government of China rejected out of hand. At the Universal Periodic Review Working Group, Canada recommended that China implement the recommendations of the Committee against Torture. The Government of China explicitly, in writing, rejected this recommendation. Canada, the United Kingdom, Hungary, the Czech Republic, France, Sweden and New Zealand recommended that China abolish all forms of arbitrary detention, including re-education through labour camps. The Government of China said no to this recommendation. Forced labour is an abuse of the rights of those in detention in China. It also harms workers around the world by undercutting the prices of products free workers produce for wages, contributing to global unemployment in a time of economic downturn. And it sets the stage for organ harvesting of Falun Gong practitioners. Allowing outsider access to Chinese places in detention is not an end in itself. It is rather a means to an end, to assess compliance with international standards, to ensure that abuses in detention are not occurring. Something similar can be said of forced labour. Ending forced labour is an end of itself. But it is also a means to an end. Ending forced labour and allowing independent investigators to visit places of detention would be important steps towards ending abusive organ sourcing from Falun Gong practitioners. Canada should have legislation banning the importation of goods produced through forced labour. The Government of Canada should negotiate an agreement with the Government of China committing the Government of China to ensure that prison labour products are not exported to Canada. The agreement should allow Canadian officials to gain access to Chinese production facilities suspected of exporting forced labour products. The fact that China has not respected similar agreements with the United States is no reason to abandon the effort to stop the export of forced labour products from China. Where the efforts of one country, the US, have failed, the efforts of many countries may succeed. In any case, at the end of the day, when it comes to promoting respect for human rights, we can never rest content with no as an answer. U.S. Department of State 2005 Country Reports on Human Rights Practices – China, March 8, 2006. Concluding observations of the UN Committee against Torture on China UN Document number CAT/C/CHN/CO/4, 21 November 2008 paragraph 18(C). This article comprises remarks made by David Matas at a Forum on Human Right in China held in Canada’s Parliament buildings on May 27, 2009. Below is a self-explanatory letter to the International Olympic Committee listing major concerns affecting the international community and arising out of appalling policies of the Beijing government, which are only now garnering international attention. Please consider co-signing this letter to indicate your solidarity with those who are determined “never again” to stand idly by and turn its eyes away from genocide as the world did from 1931 to 1945. Your support in advancing the cause of human dignity is invaluable at this crucial time and it is greatly appreciated. The persecution of Chinese citizens who practise Falun Gong constitutes a violation of China’s constitution by the Beijing government. That persecution of Chinese citizens is well known. However, the host country for the 2008 Olympic Games has now extended its discriminatory religious policies to the entire international community through these recent declarations. Beijing, as host country is saying that while participating foreign athletes who are Christians will be allowed to bring bibles into the Olympic Village and to practise their faith while residing there, foreign athletes who are Falun Gong practitioners will not be allowed to bring Falun Gong materials or to practise their Falun Gong exercises. In fact, foreign athletes who are adherents of Falun Gong may not be allowed to participate in the Games at all. This is eerily reminiscent of the situation which obtained before and during the Nazi Olympics of 1936 in Berlin. Within Germany, Hitler barred Jewish citizens from competing for places on the German Olympic team. Unlike his contemporary counterparts in Beijing with respect to Falun Gong, Hitler did not go so far as to impose restrictions on Jewish competitors from other countries. Nevertheless, his discriminatory racial and religious policies within Germany itself provoked a widespread call in the United States for a boycott of the Nazi Olympics and many Jewish athletes refused to participate. Not only does this latest order further demonstrate the Chinese regime’s unwillingness to fulfil its 2001 promise to the IOC to improve human rights in China, but also it is clear proof that any hope of improving Chinese human rights through the Olympics is futile because of Beijing’s total and demonstrable insincerity. You may recall that in April 2007, Beijing’s Ministry of Public Service issued a black list barring ‘antagonistic elements’ from attending the Games including adherents of Falun Gong, “religious infiltrators” and others. Although this was a clear violation of the Olympic Charter, we are unaware of any declaration by the International Olympic Committee that it will enforce that Charter or that the IOC is at all concerned about the fact that Beijing has trampled upon the Charter. Li Zhanjun’s response clearly demonstrates that the Chinese government’s policy of persecuting Falun Gong and its practitioners continues unabated. The Chinese Communist Party (CCP) has overtly extended the regime’s persecution of Falun Gong to the Olympics – a most noble institution that is respected worldwide. Such abuse and discrimination against the followers of a peaceful spiritual teaching not only trash the Olympic Spirit, but also constitute a spurning of fundamental morality and ethics in the international society. Having called upon the world not to politicize the Olympics, Beijing’s leaders have persistently, continuously and consistently turned their hosting of the Games into a totally political propaganda extravaganza designed to glorify, whitewash, and strengthen their single party dictatorship. They have from the outset exploited the opportunity afforded them by the IOC in precisely the same way as Goebbels and Hitler before them. * to discuss the possibility of holding the Olympics in another nation. We also urge the international community and athletes from around the world to condemn Beijing’s trashing of the Olympic spirit and its scorn for the Olympic Charter. The whole world is about to learn what religious repression “made in China” means. 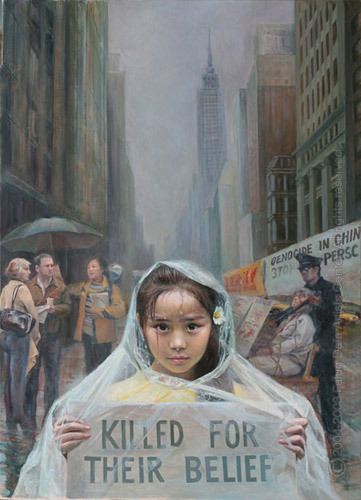 Beijing’s characterization of Falun Gong as “illegal” is a clumsy attempt to justify a pogrom of government sanc-tioned violence and persecution. There is no basis in the Chinese Constitution or in any other Chinese law for Beijing’s claim that Falun Gong is illegal in China. It is “illegal” only because the top leadership declared it to be “illegal”, and no Chinese court has the authority to interpret the Constitution and overturn the fiats of the top leaders. No judicial process was ever involved in rendering Falun Gong “illegal”. It is clear that the Chinese regime must stop using the Olympics as a cover for launching a crackdown on peaceful people of faith both in China and abroad and to halt the persecution of Falun Gong and all Chinese citizens. Hence, we, the undersigned, believe that the IOC has the moral obligation to bring the true Olympic spirit to the Chinese people as set forth in the Olympic Charter. It’s not too late for the IOC to renegotiate the location of the Olympics and bring some well-deserved sobriety and human dignity into this situation for the sake of the Chinese people and our proud athletes. Previous Olympics devolved into propaganda bonanzas for dictatorial hosts, such as the Nazis in 1936 and the Soviets in 1980, rather than promoting the universal celebration of peaceful competition and sport for people of all colours and creeds in accordance with the Olympic ideal. Beijing cannot possibly expect to freely continue with rampant political oppression, mass executions, forced abortions, illicit organ harvesting, religious persecution and a slew of other human rights abuses, while attempting to present a civilized face to the world as host of the Summer Games in 2008.